University of Arizona Press, 9780816520565, 75pp. that sent them here . . ."
The abused. The oppressed. The terrified victims of institutionalized insanity. Making daring connections between the personal and the political, Janet McAdams draws new lines in the conflict between the new and old worlds as she redefines the struggle to remain human. This award-winning collection of poetry forges surprising links among seemingly unrelated forms of violence and resistance in today's world: war in Central America, abuses against Nature, the battleground of the bedroom. McAdams evokes the absurdity of everyday existence as she sends out a new call for social responsibility. 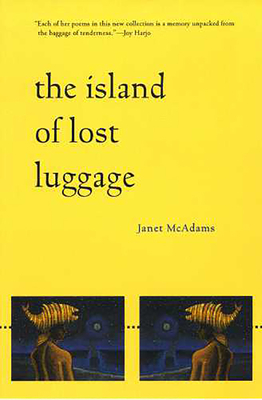 The Island of Lost Luggage is the poetry winner of the 1999 First Book Awards competition of the Native Writers' Circle of the Americas. Janet McAdams's poems have appeared in Poetry, North American Review, TriQuarterly, and other publications. A writer of Alabama Creek ancestry, she is a recipient of writer's fellowships from the Alabama and Georgia state arts councils and is currently Assistant Professor of English, Native American Studies, and Women's Studies at the University of Oklahoma.